A people that occupied territory on the coast of the Mediterranean Sea, south-west of Jerusalem, previously to and contemporaneously with the life of the kingdoms of Israel. Their northern boundary reached to the "borders of Ekron," and their southwestern limit was the Shihor, or brook of Egypt (Wadi al-'Arish), as described in Josh. xiii. 2, 3. Their territory extended on the east to about Beth-shemesh (I Sam. vi. 18), and on the west to the sea. It was a wide, fertile plain stretching up to the Judean hills, and adapted to a very productive agriculture. In Biblical times this territory was occupied by several peoples, the most prominent of all being the Philistines proper. There are found the giants or Anakim in Joshua's day and even down to David's time in Gaza, Gath, and Ashdod. It must be concluded, too, from Joshua's conquests that the Canaanites were to be met with here and there throughout this territory. It is also to be presumed from the records that other peoples, such as the Amalekites and the Geshurites, lived near this territory if they did not actually mingle with the Philistines. Who were the Philistines proper? The Biblical record states that they came from Caphtor (Amos ix. 7; Deut. ii. 23), that they were Caphtorim (Deut, l.c. ), and that they were "the remnant of the seacoast of Caphtor" (Jer. xlvii. 4, Hebr.). The table of nations (Gen. x. 13, 14) names the Philistines and the Caphtorim as descendants of Mizraim. 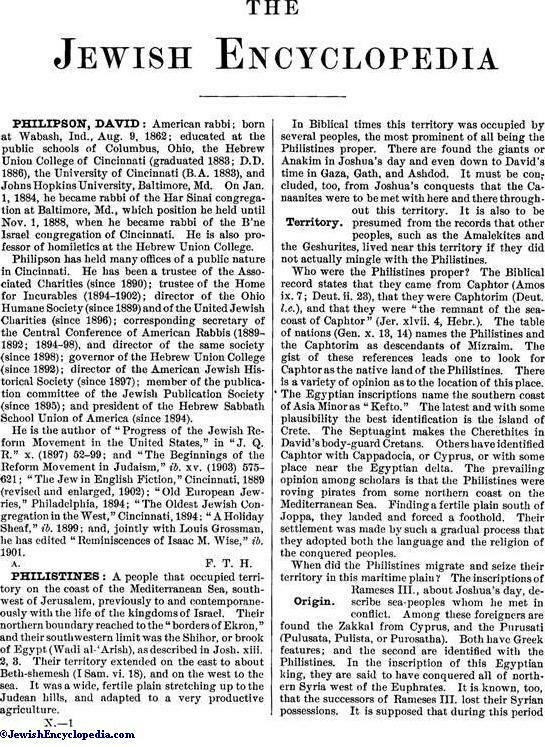 The gist of these references leads one to look for Caphtor as the native land of the Philistines. There is a variety of opinion as to the location of this place. The Egyptian inscriptions name the southern coast of Asia Minor as "Kefto." The latest and with some plausibility the best identification is the island of Crete. The Septuagint makes the Cherethites in David's body-guard Cretans. Others have identified Caphtor with Cappadocia, or Cyprus, or with some place near the Egyptian delta. The prevailing opinion among scholars is that the Philistines were roving pirates from some northern coast on the Mediterranean Sea. Finding a fertile plain south of Joppa, they landed and forced a foothold. Their settlement was made by such a gradual process that they adopted both the language and the religion of the conquered peoples. When did the Philistines migrate and seize their territory in this maritime plain? The inscriptions of Rameses III., about Joshua's day, describe sea-peoples whom he met in conflict. Among these foreigners are found the Zakkal from Cyprus, and the Purusati (Pulusata, Pulista, or Purosatha). Both have Greek features; and the second are identified with the Philistines. In the inscription of this Egyptian king, they are said to have conquered all of northern Syria west of the Euphrates. It is known, too, that the successors of Rameses III. lost their Syrian possessions. It is supposed that during this periodthe Purusati, accompanied by their families, were pushed or crowded out of their homes by the national migrations from the northeast in Asia Minor, and, coming both by land and by sea, secured a foothold in southwestern Palestine. The time of this supposed settlement was that of the twentieth dynasty of Egypt. Of course their first settlements were on a small scale, and probably under Egyptian suzerainty. Later, as Egypt lost her grip on Asia, the Purusati became independent and multiplied in numbers and strength until they could easily make good their claim to the region in which they had settled. According to the Old Testament, the Philistines were in power in their new land at least as early as the Exodus (Ex. xiii. 17, xxiii. 31). Josh. xiii. 2, 3 lends color to the view that they had specific boundaries in the time of the conquest. During the period of the Judges they were a thorn in the side of Israel (Judges iii. 31, v. 6, x. 11, xiii-xvi.). They were so well organized politically, with their five great capitals, Ashdod, Ashkelon, Ekron, Gath, and Gaza, and a lord over each with its surrounding district, that Israel in its earlier history was put to a decided disadvantage (I Sam. iv. 17, vii. 2-14). Their supremacy over Saul's realm (ib. xiii. 3 et seq.) and their restriction of Israel's arms made the Philistines easy rulers of their mountain neighbors. Saul's defeat of them at Michmash (ib. xiv.) was only temporary, as he finally fled to Gilboa before the invincible ranks of these warriors. Not until David's assumption of supremacy over all Israel and after two hard battles were the Philistines compelled to recognize the rule of their former subjects. This broke their power so effectually that they never entirely recovered. After the disruption of the kingdom of Solomon the Philistines secured their independence, which they possessed at intervals down to the overthrow of the Israelitish kingdoms. During this entire period they are found exercising the same hostility toward the Israelites (Amos i. 6-8; Joel iii. 4-8) that characterized their earlier history. In this same period the Assyrian conquerors mention several Philistine cities as objects of their attacks. The crossing and recrossing of Philistines territory by the armies of Egypt and Asia finally destroyed the Philistines as a separate nation and people; so that when Cambyses the Persian crossed their former territory about 525, he described it as belonging to an Arabian ruler. 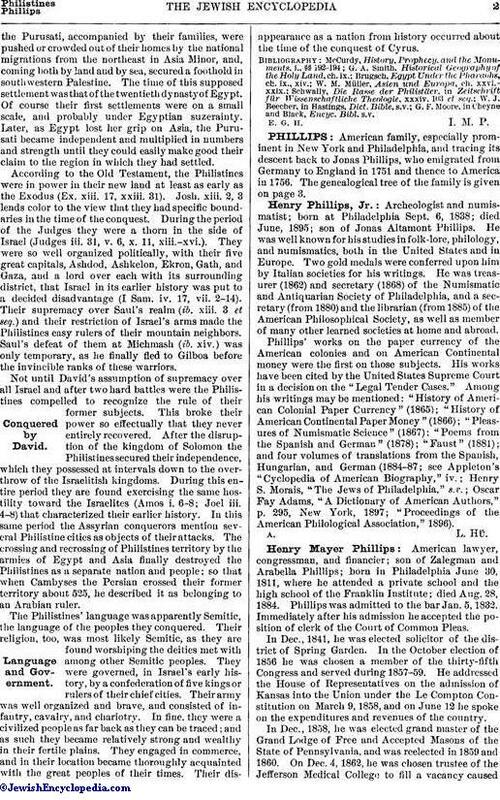 The Philistines' language was apparently Semitic, the language of the peoples they conquered. Their religion, too, was most likely Semitic, as they are found worshiping the deities met with among other Semitic peoples. They were governed, in Israel's early history, by a confederation of five kings or rulers of their chief cities. Their army was well organized and brave, and consisted of infantry, cavalry, and chariotry. In fine, they were a civilized people as far back as they can be traced; and as such they became relatively strong and wealthy in their fertile plains. They engaged in commerce, and in their location became thoroughly acquainted with the great peoples of their times. Their disappearance as a nation from history occurred about the time of the conquest of Cyrus. G. F. Moore, in Cheyne and Black, Encyc. Bibl. s.v.